Visible crossing the Sun, the giant solar active region responsible, AR 2673, is much larger than planet Earth. I like the X/Y plots in earth units. One poster suggested AR2674 should be called the "Hawaii group" - a pretty good description. Thanks for the interesting Earth size comparison, alter-ego! The Sun is indeed big. Its diameter is some 110 times the Earth diameter, so the projected, two-dimensional surface area of the Sun is ~38,000 times the projected, two-dimensional surface of the Earth, unless my shaky math is failing me. But in any case: It is no wonder that there is a lot of room for splotches and zits much larger than the Earth on the face of our fair Sun. It's a lovely APOD. Very beautiful. Sure takes my mind off those hurricanes! Yes, storms on Earth, storms on the Sun - It MUST be climate change! JohnD wrote: Yes, storms on Earth, storms on the Sun - It MUST be climate change! Not sure what you're trying to imply here, but one has nothing to do with the other. As for storms on Earth, it is accepted among climatologists that a warming climate will likely result in more frequent extremes, including storms such as hurricanes. The Sun is indeed big. Its diameter is some 110 times the Earth diameter, so the projected, two-dimensional surface area of the Sun is ~38,000 times the projected, two-dimensional surface of the Earth, unless my shaky math is failing me. The surface area of a sphere is 4 times that of "the projected" circle (not π times). Irony is indeed the most dangerous form of satire. JohnD wrote: Irony is indeed the most dangerous form of satire. If you're saying your previous post was a joke, well, sorry I didn't get it. There's enough denial out there that Poe's Law is in effect for nearly every statement made in regards to climate change. To be fair, you never seemed to get any of my recent jokes, either. Thanks. I knew I got it wrong. So, Art, could you tell me how much bigger the surface area (the photosphere) of the Sun is compared with the surface area of the Earth? An approximate value will do splendidly. neufer wrote: The surface area of a sphere is 4 times that of "the projected" circle (not π times). I think my worst mistake was that just because I thought that the Earth radius should be given the value of 1, the squared value of the radius would also be 1, and therefore I somehow thought that the surface area of the Earth should also be given the numerical value of 1. But I forgot that I had to multiply the squared value of the radius by π. I multiplied the squared value of the Sun's radius by π, but I forgot to to do same thing with the Earth radius. So the size difference between the Sun and the Earth became π times too large. But if you divide the incorrect value that I arrived at, 38,000, by π, you get ~12,000. Which is apparently the correct answer. Thanks a lot, Geck...But if you divide the incorrect value that I arrived at, 38,000, by π, you get ~12,000. Which is apparently the correct answer. What you had stated that you were interested involved the standard graphical comparison of a sunspot (or Jupiter spot) with the projected area of the Earth ... which is only 4/π larger than your original number: 48,000. However, the diameter of the Earth can also be used in Cartesian area measurement in which case 38,000 is valid. 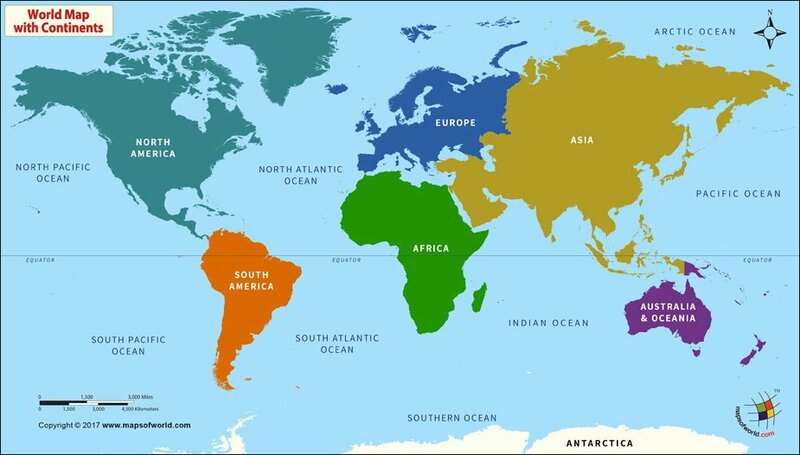 Map of the world showing the Earth as a flat rectangle. Thanks again, Art. Believe me, I trust your math skills. For myself, I'm happy if I can arrive at a moderately correct answer and understand what I've been doing in order to get the answer more or less correct. is shaped like a discus. Of course the surface of the Sun is not a flat disk. And the Earth is not a flat disk, either. Neither the Sun nor the Earth is shaped like a discus. discus (n.) 1650s, from Latin discus "discus, disk," from Greek diskos "disk, quoit, platter". discussion (n.) mid-14c., "examination, investigation, judicial trial," in classical Latin, "a shaking," from discussus, past participle of discutere "strike asunder, break up," from dis- "apart" (see dis-) + quatere "to shake" (see quash). Meaning "a talking over, debating" in English first recorded mid-15c. Sense evolution in Latin appears to have been from "smash apart" to "scatter, disperse," then in post-classical times (via the mental process involved) to "investigate, examine," then to "debate." I went the pedantic route, using A=4πr2 for the Sun, then for the Earth, and dividing the latter into the former. I got a value of 11,921.6 times greater surface area of the Sun than the Earth -- close enough to 12,000 since we're not thinking of dividing it up into building lots. heehaw wrote: How many angels can dance on the head of a pin? There is no analytical algorithm for this packing problem (spheres in a sphere, or circles within a circle). Fitting very small circles into a very large one, the packing density seems to approach somewhere around (in an apparently diminishing, oscillatory way) ~78.5%. This density is the value for fitting 1000km circles into the Sun (1,391,400km). For Earth-sized circles (12,742km), the packing density ~78.3%. The calculated number of Earth-sized circles that fit into the Sun ~9335. Maybe in the limit, as n → infinity, the packing density can be derived. The highest packing density demonstrated in this paper was ~81.6% for a 55 circle-packing case. honeycomb packing with a limiting packing density of ~90.69% [= π/sqrt(12)]. This gives ~10814 Earth-sized circles into the Solar circle. Square watermelons. Photo: The Asahi Shimbun, via Getty Images. The Earth as a cube. 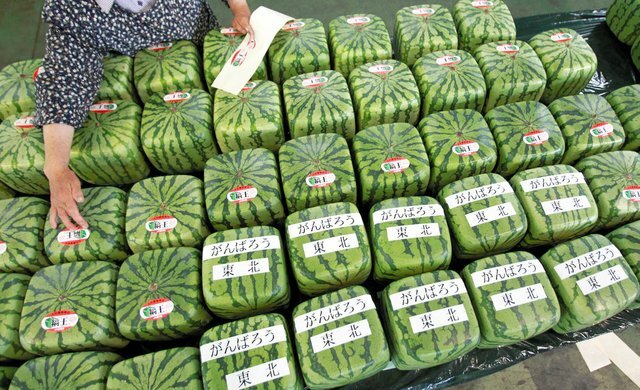 The storing problem probably explains these cube-shaped watermelons, grown in Japan. If the Earth was a flat square square and the Sun was similarly square, the packing of small Earth-squares onto the surface of the large Sun-square would be much easier. If both the Earth and the Sun were cube-shaped, the entire volume of the Sun could be filled to capacity of Earth-shaped cubes. Of course, a cube-shaped Sun would certainly require altogether new physics. Check out this page to learn what conditions on the Earth would be like if the Earth had miraculously been cube-shaped. At least that would be a lesser miracle than turning the Sun into a cube. Storing Earths, cube-shaped or not, inside the volume of the Sun until the Sun was "filled up", would certainly change the Sun very much. Since the Sun's volume is (very[ approximately)/i] a million times the volume of the Earth, but the mass of the Sun is only (very approximately) 300,000 times the mass of the Earth, packing the volume of the Sun with objects the size and mass of the Earth would make the Sun ~ 3 times more massive. All other things being equal, this would turn the Sun into a 3 solar mass star midway between Vega and Regulus. Of course, a star made up of a million Earths would be anything but normal. The Sun is made up of, in total mass, 71.0% hydrogen, 27.1% helium, 0.97% oxygen, 0.40% carbon and 0.099% silicon. The Earth, by contrast, is made of the following elements in bulk mass: iron (32.1%), oxygen (30.1%), silicon (15.1%), magnesium (13.9%), sulfur (2.9%), nickel (1.8%), calcium (1.5%), and aluminium (1.4%). I guess all the iron in a million Earths would sink to the center of the volume of the Sun, creating a dead iron core and making the Sun explode as a supernova! Or am I wrong, what do you think? I agree. How fast packing density approaches the limit is a question. I found a detailed study of equal-sized circle packing within a unit circle. It is fairly complete up to about 4500 packing circles, and 5000 circles is the maximum. The tabulated packing density = 88.755% for 5000 circles. I captured the table and plotted it. There's no doubt my earlier 78% answer is wrong, and the true answer is closer to the packing density limit. Interestingly, it looks like 12000 circles may break 90%. How fast packing density approaches the limit is a question. I found a detailed study of equal-sized circle packing within a unit circle. It is fairly complete up to about 4500 packing circles, and 5000 circles is the maximum. The tabulated packing density = 88.755% for 5000 circles. There is a quasi periodicity with a period length of ~N/14. I wonder if that is real or simply an artifact of the algorithm struggling with the large numbers. Same as the number of licks it take to get to the Tootsie Roll center of a Tootsie Pop - three!